Hooshang Amirahmadi holds a Ph.D. in planning and international development from Cornell University and is a professor at Rutgers, The State University of New Jersey. He is also director of the University’s Center for Middle Eastern Studies CMES). Professor Amirahmadi has served as chair and graduate director of his department at the Bloustein School and as the University Coordinator of the Hubert Humphrey Fellowship Program. 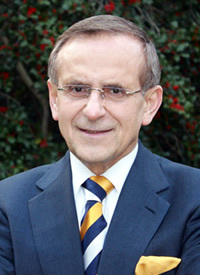 He is founder and president of the American Iranian Council (www.american-iranian.org), a research and policy think-tank devoted to improving dialogue and understanding between the peoples of Iran and the United States. Dr. Amirahmadi is also a founder of the Center for Iranian Research and Analysis and served as its director for many years. He was a candidate for President in the Nine Presidential Elections in Iran in June 2005, but the conservative and religious Guardian Council disqualified him for his American citizenship and democratic platform. Dr. Amirahmadi is also the president of Caspian Associates, Inc. (www.caspian-associates.com), an international strategic consulting firm headquartered in Princeton, New Jersey. Professor Amirahmadi is the author of Revolution and Economic Transition: The Iranian Experience, the first book-length analysis of the post-revolutionary Iran, and three other books in Persian on civil society, industrial policy, and geopolitics of energy. Dr. Amirahmadi is also editor of 10 books on Iran and the Greater Middle East, and 16 conference proceedings on US-Iran relations. His edited books include The Caspian Region at a Crossroad: A New Frontier of Energy and Development; Small Islands, Big Politics: The Tomb and Abu Musa Islands in the Persian Gulf; The United States and the Middle East: A Search for New Perspectives; Post-Revolutionary Iran; Iran and the Arab World; and Reconstruction and Regional Diplomacy in the Persian Gulf. He has also authored over 200 journal articles and book chapters as well as numerous editorials, magazine articles, interviews and book reviews (in English and Persian). A frequent contributor to many conferences in Europe, North America, Asia, Latin America, Africa and the Middle East, Dr. Amirahmadi’s writings have been translated and published in Europe, Iran and the Arab world. He is a recipient of several competitive fellowships and grants from distinguished private foundations and corporations including Department of Higher Education, Rockefeller Brothers Fund and Open Society Institute, and is a frequent contributor to national and international TV (including CNN, FOX, BBC, ABC, PBS, VOA), radio, and newspapers. He has also served as consultant for the UNDP, the Aga Khan Foundation, the World Bank, and several governments, law firms, and private companies throughout the world. Professor Amirahmadi detected and wrote on the Iranian civil society and reform movement long before it actually materialized in the administration of President Mohammad Khatami. He also predicted its demise and the reappearance of anti-reform forces. Dr. Amirahmadi’s pioneering work on dialogue, understanding and better relations between the United States and Iran is widely acknowledged in the United States, Iran and beyond. His graduate teachings at Rutgers include courses on global restructuring and public policy, international economic development, and national and regional development planning and policy. 2015: پیش به سوی ملت گرایی ایرانی برای جاودانی سرزمین و شادمانی مردم در علم و جامعه: جشن نامه دکتر ناصر طهماصبی.” اردیبهشت 1394 ” (Towards Iranian Nationalism: for eternal territory and contented people.) Pages: 17-27.